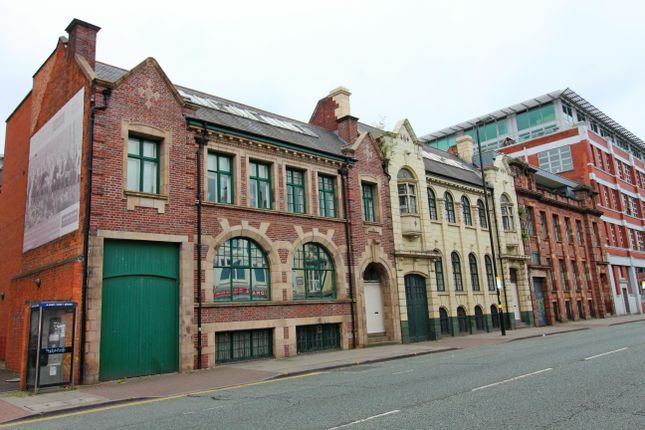 The properties are situated in a prominent location fronting the main A41 Great Hampton Street on the fringe of Birmingham’s historic Jewellery Quarter. The main A41 is a main arterial route which leads direct into Birmingham City Centre, being ¾ of a mile South East and Junction 1 of the M5, being 1.5 miles to the North West. The main Aston Expressway (circa 1 mile due East), provides direct access to Junction 6 of the M6 Motorway “Spaghetti Junction”. St Pauls tram station, Tesco Express and the College of Law are all located within walking distance of the subject premises. The property comprises of a 3 x three storey self-contained buildings of brick built construction surmounted by a pitched tiled roof. Internally the offices are of modern construction built behind a Grade II listed Edwardian façade with the upper floors having been converted to residential apartments and sold off on 150 year leases from 25th March 2006. The offices are arranged on the basement and ground floors and benefit from carpets, plaster & painted walls and ceiling, inset ceiling light points, gas fired central heating (where applicable), a kitchenette and WC accommodation. Each building benefits from 2 car parking spaces. We are advised that electric & water services are connected. The freehold interest is available with offers in the region of £810,000 for the three office buildings plus VAT with a ground rent of £3,750 per annum between the offices and apartments. Alternatively, the long leasehold is available with offers in excess of £750,000 plus VAT for the three office buildings or £250,000 plus VAT for each one. The long leasehold is held for a term of 150 years from 25th March 2006 at a ground rent of £250 per annum per unit.